Beware of your subliminal messages…. So I go to my Friday £60 at Asper’s game arriving at 7:12 p.m,. 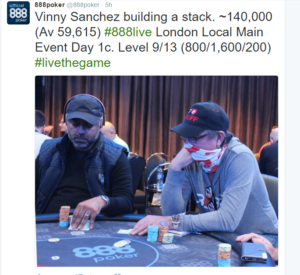 to find that there was a 888 £220 tournament already running from 6 p.m. I NEVER do well in a tournament if I am not seated at the table to see the first card off the deck at the first level. I’ve never bought in with cash to a tournament over £100 except in Las Vegas, I’ve always qualified. I find a cash point pay the £1.50 cash point fee and buy in for £220 and we start a new table in seat 2 at table 13. Blinds are 150/300 50 ante so 900 pre-flop. UTG raises to 600 cutoff calls and I flat with As6s and SB make it 2,100. UTG folds and cutoff calls and I complete 7,500 pre, the flop comes QsJs6d giving me bottom pair and nut flush draw..”aghhh!! this could get messy” I think. Big Blind leads for 4,000 and cutoff folds and I call, I consider re-raising but didn’t want to be blown of my equity with a re-raise if he had a set of queens or jacks. He checks and I shove 16,900 all-in and he sighs but call and I’m done and dusted. I’ve blown £220 in under 10 minutes, so Negreanu does it and is a genius and me a complete donkey. I thought the queen was a good card for me and he’d fold his Kings, who wants to bust on their first hand with just a bluff catcher? I’d even called his hand on the flop for him, perhaps the queen wasn’t the best bluff card in the deck. Now I have to go back tomorrow at 2 pm and put the wrong right, I hope I have a happy ending otherwise it is a £440 weekend in the continues game that is poker. 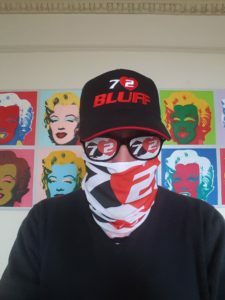 If you bluff your opponent, he may get a read or find a call if you dress like I do below. I didn’t consider hard enough his view of my table image. Currently reading the Zen of Poker and it’s main premise is learn how to fold and to emotionally disassociate yourself from the game and it variance. It is a good book as I realise that I haven’t quite yet learnt to detach myself from the game. There is a Zen level for me to attain where I will have no emotion just mastery and I look forward to it. You never go home cursing that you left value on the table, but you do go home miserable when you slow play your big hand and get outdrawn. Save yourself the heartache. Admittedly Vicky Coren wouldn’t have folded pre-flop but this is an example of the concept, get the majority of your chips in good is my advice. The Poker Hall of Fame this is where every player dreams of ending up as it shows you have arrived in the game. In 2011 the “Chip Reese” Rule was brought in where players had to be over 40 years old. This was due to the public ballot votes for Tom Dwan in 2009, a good rule given that Dwan is now busto…or rumoured to be. If you make it you can join Wild Bill Hickok and one of my favourites Nick Dandolos. There has been criticism that the nominations and hall is American focused and hopefully the British campaign for Dave “Devil Fish” Ulliott will lead to him finding his place. Dave was certainly an influence for me as he embodied everything I thought a poker player/gambler should be, I only saw him once live as I hung on the rail and enjoyed show. Best Hero Call or Best Read…the only poker tell I pay attention to…. 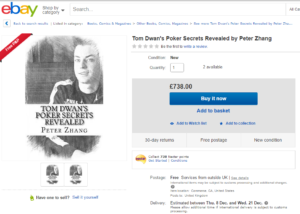 Free Postage – Only £738 for Tom Dwan’s secrets for going busto…. 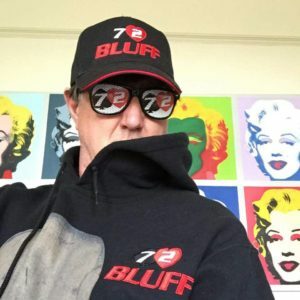 I bought Jeff Hwang’s book a long time ago but it may be time to learn Pot-Limit Omaha, it is a gambler’s game as Isildur shows here. 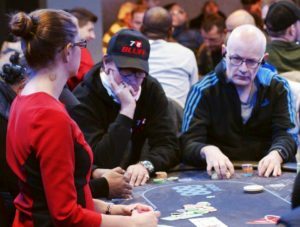 The days of the $1.3M pots are surely over…Interesting article about Patrik Antonius’ 5 biggest pots. It’s refreshing to see how hard Doug Polk is finding making money in poker… 20 days in up $68 on his initial $100, I don’t feel so bad.